San Andres Warriors (LPB) landed experienced 38-year old American ex-international shooting guard Cory Bradford (191-78, college: Illinois). It is actually his comeback to San Andres as he has played here before. Bradford played in the summer at Chabibeh Sporting Club of Lebanon. He managed to play in five leagues in two countries last year (!!!). First Bradford played at Bosna-Royal (Division I) in league. The team played in four different competitions (!!!) that year, and he had a chance to explore basketball on different levels. In 33 Division I games he averaged 11.1ppg, 2.8rpg and 2.5apg. Bradford helped them to make it to the semifinals. He also played 4 games in FIBA Europe Cup where he recorded 15.0ppg and 2.3rpg. 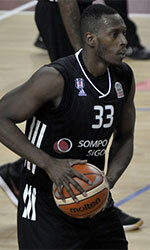 Bradford also played 20 games in ABA League where he got 10.3ppg, 1.9rpg and 1.5apg. And finally he played 2 games in Basketball Champions League where he got 7.5ppg, 2.0rpg, 1.5apg and 1.0spg. Bradford's team won Mitchell Americas Cup in 2017. He also represented Lebanon at the Liga Mediterranean Cup of Championship in Spain this year. 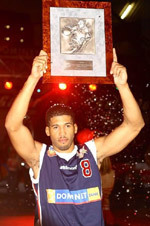 He was named Eurobasket.com All-Mediterranean Cup Guard of the Year averaging an impressive 21.4ppg. Bradford is a very experienced player. And here thanks to pro basketball he experienced life in eleven different countries playing on four different continents. He is familiar with European, Asian, Latin American and of course North American leagues. Bradford has played previously professionally in Costa Rica (Liberia), Cyprus, France (JDA Dijon), Hungary (Alba), Jordan (ASU), Mexico, Qatar (Al Rayyan), UAE, Venezuela, Colombia (Cafeteros and Guerreros) and UBA (GIE Maile Matrix). In 2003 Bradford signed with the Memphis Grizzlies of the NBA. Was later released before signing in Europe. Bradford attended University of Illinois until 2002 and it will be his 17th (!!!) season in pro basketball.